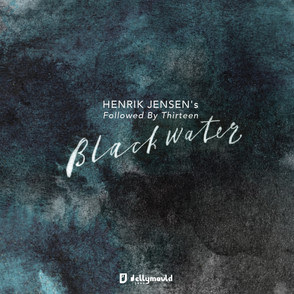 Danish-born, London-resident double bassist Henrik Jensen’s second release with his Followed By Thirteen ensemble – Blackwater (named after the river by which he proposed to his wife-to-be) – follows up 2013’s debut, Qualia. On the face of it, in jazz quartet terms, it's a pretty standard line up with trumpeter/flugelhornist Andre Canniere, pianist Esben Tjalve and drummer Antonio Fusco. But the essential tributary feeding into this album is the bassist’s deeply rhythmic and melodic influence, imbued throughout these eight original numbers, which inspires expansive, free-flowing creativity between Jensen and his personnel. Since moving to London in 1997, Henrik Jensen’s career has seen him working both in the UK and internationally; and having formed Followed By Thirteen in 2010, with Esben Tjalve, he has continued to contribute to a great many other projects with artists such as Pete Wareham, Elizabeth Shepherd, Martin Speake, Bruno Heinen and Billy Jenkins. This purely acoustic recording conveys honesty and directness – and amongst the memorable, arranged riffs (clearly a specific feature of Jensen’s writing), there’s also a sense of enthusiastic, improvisational spontaneity. The bright propulsion of The Dutch Danemann is led by an affable, shared piano-and-bass groove which Antonio Fusco’s drumming elaborates on so meticulously, whilst Andre Canniere’s brassy invention billows overhead; and London - Berlin (perhaps hinting at the leader’s collaborations with German saxophonist Peter Ehwald) switches between scurrying unison phrases and delightful lucidity, with Tjalve’s sensitively-weighted chords supporting Canniere’s imaginings (which, muted, are particularly lithe) – and, as ever, it’s the fluidic double bass technique which informs the overall flightiness. Bonza is a carefree outing which provides space for Esben Tjalve's considered, almost bluesy extemporisations; and the frequent ‘earworm’ effect of Jensen’s bass motifs can again be heard at the opening of Riccardo’s Room, its polite, held-back grind encouraging pleasingly intricate cross-rhythms from Fusco – and the switches between sublime piano delicacy and full-band vibrancy are a joy. Eloquent chordal bass solo Lullaby for the Little One sensitively segues into Schur-as, whose mellow, perhaps even mournful flugelhorn first section (with a subtle, Bachian quality) opens into bristling quartet sprightliness before returning to slumber. The smooth, late-night measure of The Unready possesses a charming elegance, Canniere’s flugel suggesting we should hear more of his obvious affinity with this instrument, whilst Jensen’s precise, song-like bass extemporisations catch the ear; and breezy bossa-tinged Cravings closes the set, featuring hearty trumpet soloing amidst more of those pliant, bass-led figures which stay in the memory (hinting at extended development in the forthcoming UK tour, 6th-27th September - TOUR DATES). A quartet album which may take a while to reveal its own, particular nuances, Blackwater’s success is as much down to Henrik Jensen’s skill as writer, instrumentalist and leader as it is the undoubted expertise of his band. Henrik and Antonio are doing a duo at Nicki Heinen's Jazz and Poetry night at the Vortex (Downstairs) on 22 September.